In my view as a private researcher who has researched the issue for years, the tribunal's ruling was also weighed down by a litany of controversies as there were eight troubling issues arising from the ruling. First, some media reports wrongly attributed the ruling to a UN-backed PCA to elevate its impact but that ended when UN spokesman Stephane Dujarric confirmed that the PCA "has nothing to do with the UN". He added: "The UN doesn't have a position on the legal and procedural merits of the South China Sea arbitration case." The PCA is not a court. It only provides a registry and secretarial assistance to "arbitral tribunals constituted to resolve specific disputes" for a fee. Second is the question of sovereignty. In the 1887 Sino-Franco Convention, France agreed that all the isles east of the Treaty Delimitation Line were assigned to China. That included the Spratly Islands, among others. France attempted to occupy the Spratlys in 1930. China protested and reminded France of the 1887 convention. In 1933, colonial Philippines contemplated annexing the Spratlys, but then US Secretary of State Cordell Hull cautioned that "the islands of the Philippine group which the United States acquired from Spain by the treaty of 1898, were only those within the limits described in Article III". He added: "It may be observed that no mention has been found of Spain having exercised sovereignty over, or having laid claim to, any of these (Spratly) islands." Japan invaded China in 1937. In the fog of war, France occupied the Spratlys in 1938. Japan evicted the French and colonised the Spratlys in 1939. After its defeat, Japan ceded its claim to the Spratlys, returning them to China. According to Professor John Anthony Carty, British archives show that "there is no dispute regarding the Nansha (Spratly) Islands and that China is the sole title-holder." Yet the tribunal ruled that Mischief Reef and Second Thomas Shoal lie in the EEZ of the Philippines, effectively awarding these two features to the Philippines. How a pre-Unclos reef and shoal owned by China could be "awarded" to the Philippines this year by a tribunal was never convincingly explained. Unclos is only the law of the sea and it has no power to award any littoral state with sovereignty or extinguish its pre-existing sovereignty over any territory. Third is the issue of jurisdiction. The tribunal had no jurisdiction on matters involving maritime delimitation or historic titles, already excluded by a declaration by China in 2006, pursuant to Article 298 (1)(a). Yet the tribunal ruled that China's historic rights were "extinguished by the entry into force of Unclos in 1994". This begs the question: Why would China bother to ratify Unclos in 1996 if by doing so its historic rights were extinguished? Why not defer ratification indefinitely like the United States did? Also, under Article 288(1), the tribunal's jurisdiction was limited to only disputes concerning the interpretation and application of Unclos. The Scarborough Shoal generates no exclusive economic zone. Five reefs are high-tide elevations. Two reefs are low-tide elevations. The International Court of Justice (ICJ) held in 1962, in the South West Africa cases, that to prove the existence of a dispute, it "must be shown that the claim of one party is positively opposed by the other". Mr Alberto Encomienda, former secretary-general of the then Maritime and Ocean Affairs Centre of the Philippine Foreign Affairs Department, told China's news agency Xinhua that "China has been for the negotiations all along, but from the beginning we are not". Since no substantive negotiation between China and the Philippines took place, there could not be any dispute. The tribunal's ruling on these assertions could be ultra vires (beyond legal power), thus null and void. Fourth is the question of bias. The rule against bias has to be strictly applied because justice must not only be done but must be seen to be done. The Philippines appointed one member of the five-member tribunal. Since China did not participate in the proceedings, four members were appointed by Mr Shunji Yanai, a Japanese judge who was president of the International Tribunal for the Law of the Sea at the material time. Judge Chris Pinto from Sri Lanka was originally appointed, but since his wife is from the Philippines he gracefully resigned to avoid any controversy. The Chinese media have voiced a reasonable suspicion that none of the arbitrators were China- friendly. They also pointed out that Mr Yanai is a right-wing nationalist who is a close adviser to Japan's Prime Minister Shinzo Abe and should have recused himself, as Japan has a serious territorial dispute with China over the Diaoyu/Senkaku islands. Fifth is the issue of reclamation on disputed features. The tribunal rebuked China for reclaiming land in reefs it considers its own. But according to Mr Encomienda, the Philippines "was the first to do reclamation in the South China Sea, so we cannot demonise China for reclamation". 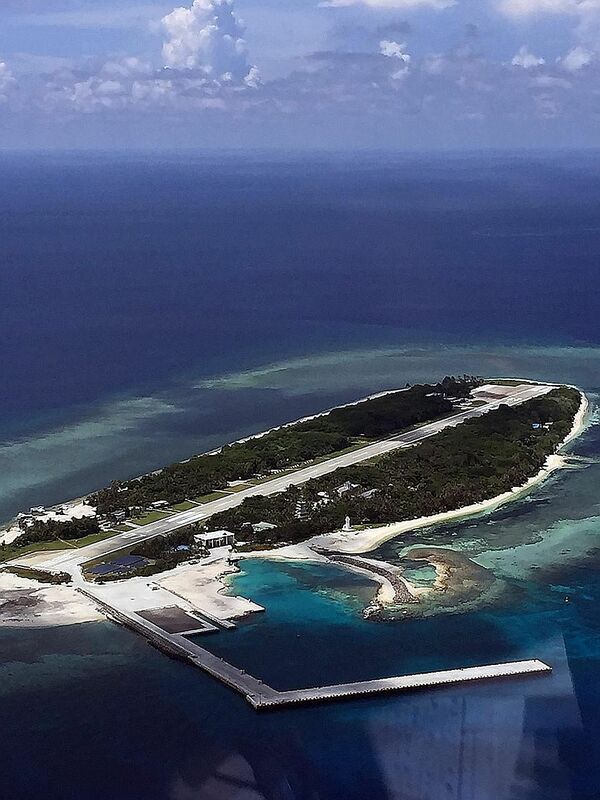 He revealed that their airfield situated on China's Zhongye Island, which the Philippines now occupies, "was built on top of live coral reefs". Sixth, the tribunal rebuked China for blocking supplies from reaching some Philippine sailors staking a claim on Second Thomas Shoal by grounding a ship. But this shoal was itself one of eight features annexed by then President Ferdinand Marcos on June 11, 1978, using presidential decree No. 1596, which violated the United Nations Charter. That decree created the Kalayaan Island Group, whose boundary illegally extended over the Spratlys. Seventh is the issue of conflict of interest over the tribunal's ruling on islands and rocks. The Philippines' gambit was that no feature in the Spratlys could generate a 200-nautical-mile EEZ and therefore there is no overlapping of its own EEZ. The tribunal stated that its jurisdiction over some of the Philippines' claims was barred "if a feature claimed by China in the South China Sea were found to be an island, entitled to a 200-nautical- mile EEZ". In 2012, in the case of Nicaragua v Colombia, the ICJ ruled that an island was defined "by reference to whether it is 'naturally formed' and whether it is above water at high tide and would generate a (12-nautical-mile) territorial sea", and to qualify for a 200-nautical-mile EEZ, "it would need to be able to sustain human habitation or economic life on its own" under Article 121(3) of Unclos. Taiping Island, occupied by Taiwan since 1946, is a naturally formed, 480,000-sq-m island which is able to sustain human habitation or economic life on its own as it has plenty of fresh water, lush vegetation, locally grown produce, buildings, a hospital, an airport, a harbour and a meteorological station, all supporting over 200 people. Since the Philippines' entire raison d'etre and the tribunal's own "legitimacy" hinged on a "game changer" decision on whether Taiping Island is an island or a rock, under the rule of fairness the tribunal should have appointed an independent UN agency to make an impartial judgment, after proper field and hydrographic surveys. Instead, the tribunal ignored the ICJ ruling in Nicaragua v Colombia, studied historical documents and maps, and ruled narrowly that Taiping Island is a rock, validating its own "legitimacy". An invitation to visit Taiping Island was rejected by the Philippines and ignored by the tribunal. In my view, this ruling was not only absurd, it also violated the legal principle of Nemo judex in causa sua, meaning "no persons can judge a case in which they have an interest". To add insult to injury, Taiwan, which lost a 200-nautical-mile EEZ, was not even consulted. Taiwan rejected the ruling as baseless. Former ICJ judge Abdul Koroma said such a complicated decision takes years to conclude. But here it took only a week during the merits stage in November last year. Eighth is the implication if Taiping Island is not really a rock but can be classified as an island. Taiping Island is about 204 nautical miles from the Philippines. If it is rightly ruled an island with a 200-nautical-mile exclusive economic zone under Unclos, Taiping's EEZ will reach the Philippines' coast and overlap with the latter's EEZ. If Taiping Island, now occupied by Taiwan, has a 200-nautical-mile EEZ and is considered a part of China under the one-China policy, it would validate the nine-dash line map that shows China's sovereignty claims over the Spratly, Pratas and Paracel Islands, Macclesfield Bank and the Scarborough Shoal in the South China Sea. Under Article 15 of Unclos, the new maritime boundary between Taiping Island and the Philippine coast is equidistant or about 102 nautical miles, revealing the eight features, annexed by president Marcos, are from China's Spratly Islands. The tribunal defied conventional wisdom, overreached and arbitrarily ruled that Taiping Island is a rock. The coast was then clear for the tribunal to invalidate China's historic rights within the nine-dash line without the inconvenience of delimitation. Some analysts have dismissed this as a political decision, which could undermine the integrity of Unclos because Japan now says the verdict's legal ramifications apply only to China and the Philippines. Japan insists that Okinotorishima, which is "a collection of tiny specks that are barely visible at high tide, located about 1,740km south of Tokyo, is an island with a 200-nautical-mile EEZ". But despite the eight areas of controversy which will keep maritime lawyers and law students busy for many years to come, the good news is that China and Asean issued a joint statement in Vientiane on July 26 without mentioning the divisive arbitration case. They have reached a new modus vivendi to resolve the South China Sea disputes "through friendly consultations and negotiations by sovereign states directly concerned". The writer is a Singapore-based commentator on Asian affairs and a private researcher on the South China Sea disputes.